I didn’t mean for this to happen, but it did. What was originally going to be a steak and Guinness pie had to be adjusted at the last minute, so I figured I’d make a good old-fashioned stew. 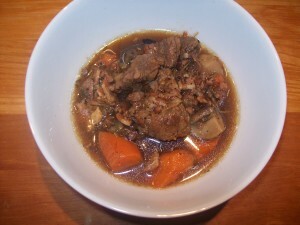 Except that while I was at it, I figured maybe I’d make it with a little inspiration from a classic boeuf bourgignon recipe, so I started with bacon and then reached for the wine and cognac. Except that there was no wine, and there was no cognac. What there was, was bourbon. Hence, bourbon beef stew, and I’m not even sorry about it. This recipe will make enough to feed a mid-size army, because I figure that if you’re making stew, you may as well make enough to freeze some. I’m pretty sure that’s the definition of working smarter in the kitchen. In a large stockpot or Dutch oven over medium heat, render the bacon until crisp. Remove the bacon from the pan with a slotted spoon and reserve. Add the olive oil to the bacon drippings in the pan. Season the beef cubes with salt and pepper. Cook the beef until browned on all sides, working in batches if necessary to avoid crowding the pan. When all the beef has been browned, remove the beef from the pan and reserve. Add the onions, garlic, and herbs to the pot and season with the remaining salt, pepper, and sugar. Cook until the onions are translucent, about 5-7 minutes, stirring frequently. Pour in the bourbon and stir vigorously. Add the beef and bacon back to the pan along with any juices, stir, and let cook until most of the liquid from the bourbon has cooked off. Pour in enough beef stock to cover the contents of the pan by about 1 inch. Cover securely, bring to a boil, and reduce the heat to a low simmer. Let the stew simmer for 1 1/2 hours, stirring occasionally. Taste the broth and adjust seasonings, if necessary. Add the mushrooms and carrots, cover, and simmer for an additional 45 minutes, until the carrots are cooked through and the beef is beginning to fall apart. If desired, serve over mashed potatoes.